Looking for a slot game that’ll help you zen out while also offering some big chances to win? NetEnt’s NRVNA: The Nxt Xperience offers a tranquil escape from everyday chaos, with a soothing soundtrack and calming vibe that takes a futuristic approach. Offering wilds, scatters, free spins and a lucrative bonus wheel, NRNA: The Nxt Xperience is a great game for players who prefer to avoid the flashing gaudiness and overwhelming sounds of a land based pokies venue. Net Entertainment games are the best in the business and can be found at a majority of the leading multi-provider online casinos. 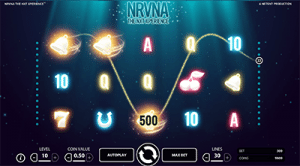 You can play the original NRVNA: The Nxt Xperience for free or real money bets in AUD at the leading NetEnt venues recommended in our casino table above. All of these casinos are fully licensed, regulated and legally accept Aussie players. Deposits using Australia currency can be made instantly using Visa, MasterCard, Neteller, Skrill and Paysafecard, while bank deposits are also available but may take a couple of days to hit your account. This makes for a minimum bet of $0.01 and a maximum bet of $150, making it suitable to all bankrolls, including the high rollers. Once your desired bet is in place, hit the spin button and you’re ready to roll. An auto-play option is also available, where you can have the computer play anywhere from 10 to 1000 rounds on your behalf. Our casinos recommended above use browser based software, which means NRVNA: The Nxt Xperience is available for instant-play directly over your web browser with no downloads required. Simply sign up, make a deposit while taking advantage of any welcome bonuses and you’re free to play NRVNA for real money bets. It can also be sampled for free in practice mode before committing to any real cash wagers. Wild symbol – the games wild is the pink orb with a star in the middle, which substitutes all other symbols to form a winning combination (except the scatter), while awarding a X3 multiplier on all bet line wins. Free spins can also be re-triggered during the free spins bonus to win even more. 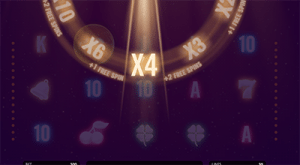 NRVNA bonus wheel – during the free spin bonus game, the NRVNA bonus wheel appears in between each free spin to randomly award an extra win – anything from free spins to an additional multiplier up to X10. Bonus multipliers apply to the current round and to all bet line wins, including wins generated from wild symbols. The bonus wheel is where the winning potential lies and you’ll holding your breath on every appearance of the scatter symbol hoping this bonus is coming your way. Although NRVNA: The Nxt Xperience isn’t particularly creative or ground breaking, NetEnt can really do no wrong in our opinion. The simple elegance of this game is testament to the strengths of the Swedish game developer, where even the more basic of games are executed in pure style and sophistication. NRVNA reminds us a bit of Glow, another NetEnt title that aims to relax while entertaining, so players who like to take the tranquil approach will be drawn to this game. The free spins bonus doesn’t come around very often, but when it does it’ll feel like all your Christmases have come at once. Play NRVNA: The Nxt Xperience at G’day Casino, our number one recommended destination for NetEnt pokies. New users who sign up using our links can claim a 100% unlimited new player welcome package plus a free slab of beer on deposits over $100.